Kaie Kellough has been based in montréal since 1998. He is a bilingual author, editor, educator, & general word-sound systemizer. His bop-inflected vox & text syncopate canada’s solitudes. kaie has dubbed & inked his way from coast to coast, B.C to QC, N.S to the U.S.
Kaie’s latest book is Maple Leaf Rag (poetry, Arbeiter Ring Publishing, April 2010). He is the author of Lettricity (cumulus press, ‘04) & co-editor of the talking book anthology (Cumulus Press, 2006). 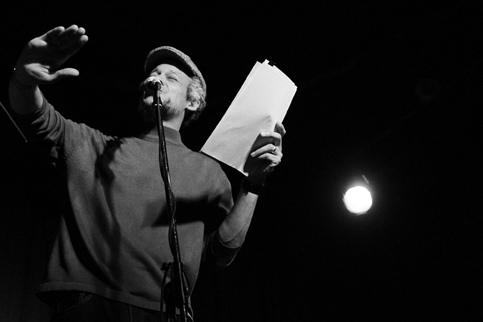 He was writer in residence for the ‘05 Toronto International Dub Poetry Festival. Kaie & his work have been featured on CBC Radio, Zed T.V, & BRAVO TV. In 2008 he was the subject of a short national film board doc titled ebon flow. Kaie has conducted language & sound workshops across Canada. He is set to record a suite of the poems in Maple Leaf Rag with instrumental accompaniment in 2010. The recordings, titled Vox Versus, will be available on this website. KK: Poetry can deeply engage the sonic and rhythmic qualities of language. Poetry’s versatility has also always been of interest. A poem can be purposed toward silent reading, stage performance, audio recording, video (videopoem), and even language-art installation. I try to create works that have this built-in flexibility, works that will function – or that will lend themselves to interesting interpretation – on and off the page. KK: This depends on the kind of work I am doing. When I was working on Maple Leaf Rag, walking became a big part of my creative process. Even in mid-February, I would take late-night walks around Baldwin Park, which is very close to where I live. On those walks I would talk out my ideas and try to find points of intersection between them. Very often, the moment I got home I had the first lines of a poem in mind, or I knew how to edit something I had already written. These walks helped me discover ways to employ word-games, other devices, or literary constraints that I found interesting. Lately I’ve been composing sound-poems, and these begin with vocal sound itself. Once the sound has been structured into a pattern, a visual, text-based representation is created. These text-based representations are my own versions of scores. I’ve also been writing fiction, and that process has its particularities. For me, fiction it is not guided by sound or by more abstract devices (like literary constraints or word-games). It is linked to remembering, and to the ways we remember experience; what we feel when we remember. I often begin with an image, which is linked to an event or series of events, and progress from there. KK: It’s 2011, so I’ve been writing since about 1995. KK: These days I try to draw influence from a broad range of sources – both literary and extra-literary. I look to music, linguistics, visual arts, urban planning, recycling, journalism, internet searches, advertising, graphic design, everyday speech, etc. I take things I think I can use, ideas or structures that might work well in a literary context. My formative influences included poets from the Harlem renaissance, poets from the Black Arts Movement (BAM), like Jayne Cortez, poets from the Caribbean and the Antilles, like Kamau Brathwaite, Aimé Césaire, and Jean Binta Breeze. Formative influences also came from the English and American canons. Modern Canadian writers like George Elliott Clarke and Wayde Compton, who are both brilliant, taught me how to seam these influences together. BCP: Your poetry is emotional, honest, and stimulating. What do you try to convey to your readers? KK: Thanks for the generous comments. Overall, I try to present a unique experience of language, something that people will not get from a popular song, a novel, a newspaper article, a conversation, or otherwise, an experience that people can only access through poetry. I want that experience to be at once sonic, highly visual, and conceptual. BCP: This is Black History Month. What does Black History Month mean to you? What do you want to see come out of Black History Month that has not come out in the past? KK: Black History Month is tricky. I’ve always been interested in the histories of people from the African Diaspora, and during BHM there are often excellent presentations and performances to be seen. Much BHM programming is family-friendly as well, so it can provide good learning opportunities for children. Since moving to Montreal in 1998, I’ve never been part of any BHM celebrations. This may be because I didn’t grow up within Montréal’s Black community, and I have never lived in the areas where the community is concentrated. BCP: The poetry you have shared has lots of history in it. At times I felt like I was in a really fun history class that got history right. Is there conscious effort on your part to educate readers about Black history through your poetry? KK: Concerning English speaking Black cultural production, Toronto is a hub. New York is a massive engine. But Montréal is just a little piston. This has two different consequences for artists. It can drive artists after a kind of “authenticity,” drive them to fit into the trends established in the major centers. At worst, this drive for authenticity can equal mimicry. At best, it can help to found a local branch of a foreign tradition, and that branch can become more responsive to our local experience. On the other hand, living outside of the major centers can release us from narrow constructions of authenticity. This can allow us to create more freely, to select freely from Black history, and to mix and match elements that seem unlikely: mixing the social protest poem with constraint-based writing, for instance. I’m interested in local histories, local voices, and in how events that have a larger, moreinternational scope intersect with the local. How do we use those events to create our own identities? What is our place within that larger context? And how do international events resonate locally? In Montréal, these questions are relevant to our language. In public places you can hear people nimbly switching from French to Creole to English, or from Arabic to French, or from Spanish to French to English. This movement from one language to the next is accompanied by an ability to mix slang expressions, postures, and cultural references. I’ve tried to produce an equivalent of that process in poetry. BCP: Many Black heroes are mentioned in your poetry. It was refreshing to see names like Angelique and Sojourner Truth. Most times, Black heroes that are written about are men like Martin Luther King and Malcolm X. How did you gain such consciousness about female Black heroes? Are you a feminist? KK: I think you’re giving me more credit than I deserve. BCP: There is a great respect for boxers in your collection. You dedicated an entire poem to Bernard Hopkins, a living legend who is not very recognized outside of the sport. Why the interest in boxing? KK: I was a young kid during one of the last great periods of North American boxing. That period was written about in an interesting book called “Four Kings,” that chronicles the careers of Sugar Ray Leonard, Marvin Hagler, Thomas Hearns, and Roberto Duran. Back then, boxers were mainstream celebrities. Surar Ray Leonard and Marvin Hagler were featured in Coke and Pepsi advertisements. Hagler even appeared on The Cosby Show. I was exposed to boxing back then, when major bouts were televised on CBS Wide World of Sports. Nowadays, in North America, the sport’s public presence has shriveled, but I still follow it. BCP: Your poetry is very musical and is described as jazz infused. Do you see poetry, boxing, and jazz as having things in common? KK: I just finished a full-length CD, called Vox Versus. It moves between sound poetry, lyric poetry, and a few language games. The CD is based around duets – collaborations between poet (voice) and instrumentalist. There are collaborations with trap kit, upright bass, a DJ’s sound- collages, piano, trumpet, and with another voice. It should be released this summer. The CD was recorded in early 2010. Over the last year it’s gradually been mixed, listened to, mixed some more, listened to, mixed yet more, and finally mastered. It’s a first recording, so I’m excited about its release. I’m also working on some short fiction. It’s going slowly, but it’s given me a completely new side of performance to explore – that of storytelling. BCP: When do you expect to have a new collection of poetry published? KK: I don’t have any expectations right now. I have a small group of new poems, and I’m developing them gradually. I’ll soon return to them, but now I’m focused more on oral performance, and short fiction. I try to work on different kinds of projects, and to have a series of different projects ongoing at any moment. BCP: Can you give readers a short recommended reading list for Black History month? BCP: What advice do you have for other writers out there who are having difficulties with their writing, or who have yet to see their work in print, or who are afraid to perform their poetry? KK: Do it, pursue it. If you don’t, you’ll regret it. 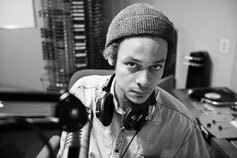 Tune in to Black Coffee Poet Friday February 4, 2011 for a video of local poet and musician Jamal Harvey rapping about Black History Month. 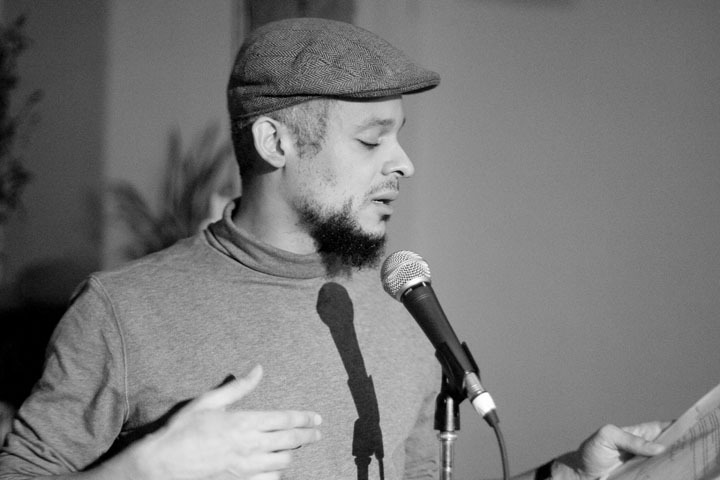 This entry was posted in Poetry and tagged "Maple Leaf Rag" by Kaie Kellough, Black Coffee Poet, https://blackcoffeepoet.com/, Interview with Kaie Kellough. Bookmark the permalink.